Yes, there really are twelve exclamation points there. Tony Cornish is just not having any pansy pro-gay nonsense on his watch. When a concerned constituent wrote to her State Representative expressing her concern over his support for a proposed constitutional ban on gay marriage in Minnesota, Cornish simply disregarded her letter with the response you are seeing below. Tony Cornish has HAD IT with these motherfucking gays on this motherfucking plane! If Cornish is unwilling or unable to address the political concerns of the people he was elected to represent, then perhaps it’s his political career that should be put to rest. You are of course invited to let Mr. Cornish know how you feel about his brusque response in an email of your own. 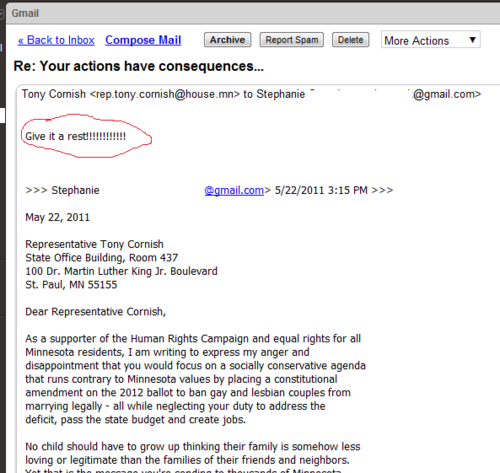 Send rep.tony.cornish@house.mn a letter and sound off. No death threats or “go to hell” crazy talk, please. Just tell the man how you feel.